At Wimbledon Driving School, we want to do everything we can to help our pupils succeed on their driving test. On your driving lessons, your instructor teaches you everything you need to know about driving safely and how to pass your test. However, a two hour lesson per week isn’t enough to get everything feeling like second nature – after all, practice makes perfect. Ask an eligible friend or relative to supervise your driving outside of lessons, so you can get that perfect parallel park. It may be tempting just to practise on the routes your instructor takes you on, or the ones you know the test centre use. But while that quiet cul-de-sac is perfect for turning in the road, it’s important to get used to roads you don’t know. You should feel comfortable driving, whatever the weather. Practise on the scorching summer’s day, practise through that torrential downpour – practise, practise, practise! Booking on a lovely spring afternoon may seem like a good idea at the time… until the April Showers come. Don’t risk being caught out by changing weather conditions. You’ve passed your theory, so you don’t need your Highway Code anymore, right? Wrong. You may not need to read it cover to cover, but brush up on road signs and anything you’re unsure of. Don’t let unnecessary uncertainty creep into your test. By having your instructor take you on a mock test, you can familiarise yourself with the style of test and the things that could be asked of you in it. Have a drive to warm up just before your test – by not going in cold, you will relax slightly before embarking on the test, which can only be a good thing. Don’t tell everyone you’re having your driving test – this piles unnecessary expectation and pressure on you. Do not listen to everyone’s horror stories about how they failed their tests – why let other people’s mistakes affect your performance? Don’t rush through the test – take your time. Also get to the test centre in plenty of time so again, you can familiarise yourself and relax. 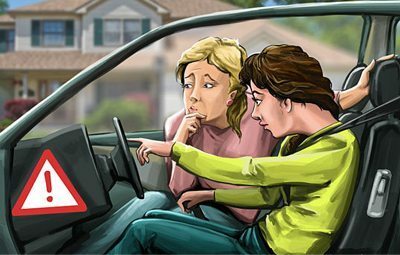 Listen to everything your driving examiner says – you don’t want to make a mistake just because you misheard the instruction. Don’t feel uncomfortable about asking them to repeat an instruction – they would much rather repeat what they said than you do something completely different and potentially fail the test. This includes shoes. A driving test isn’t an interview, nor is it a catwalk. Whatever you usually drive in, if that’s comfortable for you, wear it. You won’t get marked down for wearing trackies and trainers. Follow our nine top tips to increase your chances of a smooth driving test experience – good luck!